This is an uneven film that gets much better as it goes on. The problem with the film is that the man at the center Bahadur comes off as either bland or a bit of a jerk for a good part of the film. I haven't figured out if the problem is the script or the performance but it's not hard to believe that Bahadur wasn't getting anywhere in his life was because he was an idiot, not finishing school and not having any good ideas.Its probably not until we're a third of the way in that we actually begin to like him. Whether the real Bahadur is this way or not its miscalculation on the part of the filmmakers, since it takes too long to really warm to the film. That said the performances other than Evan Peters are fine. 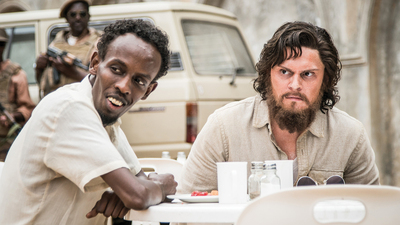 The film also makes the case for Oscar Nominee Barkhad Abdi to get more film roles. He grabs the screen and holds it and limiting him to roles like this is a waste of his talent. He deserves more roles, even starring ones. Bumps aside I really like the film, I just wish I the script were better because when the film works its great. A word of warning if you're looking for an Al Pacino film look elsewhere. While he devours the scenery, he is only in about four scenes. Melanie Griffith, who plays Bahadur's mom, has about four scenes as well. I really liked the film! I had no problems with it at all!